Hi everyone! Zoulah welcomes you to Centerpiece Wednesday and Tablescape Thursday. 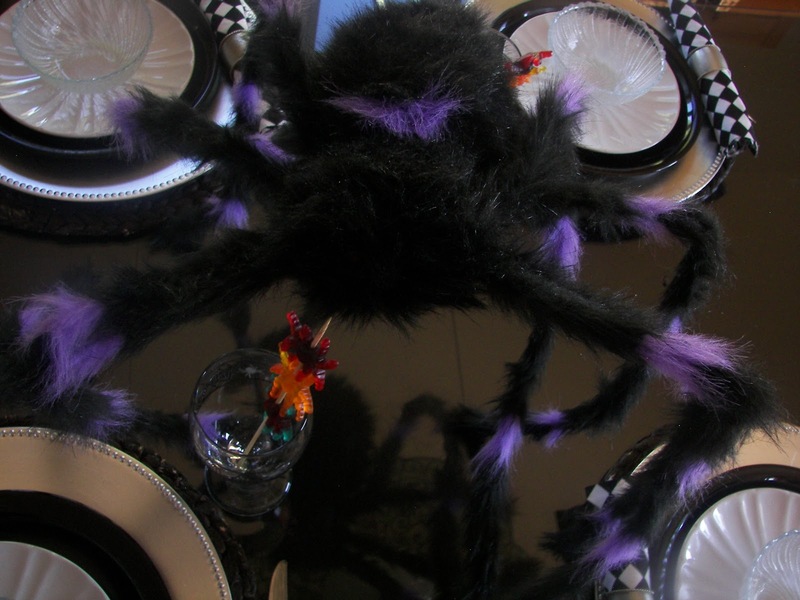 Zoulah is so happy to bring you a Spider Tablescape in honor of her pet spider. His name is Leggs. He is rather big shy so this is the only shot we will have of him. This is the individual place setting that Zoulah set. That Zoulah is so clever. 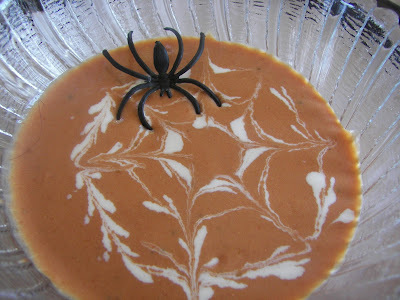 She even showed us how to make spider webs in our Tomato Basil soup and included a spider. I watched Zoulah do the web and it is really easy. Most of you know how to do it, but just in case you don't, I've included the directions below. Zoulah had the Red Couch children made webs on their soup before slurping eating their soup. 1. Put cream in a baggy or squirt container. If using a baggy, put tiny hole in corner. 2. Put drops of cream in a circle on the soup nearest the rim of the soup bowl and then, with skewer, drag the dots together. Then do the same in the center of the soup. You now have two circles. 4. Then drag about seven lines from one circle (from the inside to outside) to another circle to make the web effect. It was fun for the Red Couch Kids. Zoulah served soup and Spider Bread. Click HERE for yesterday's post on Spider Bread. 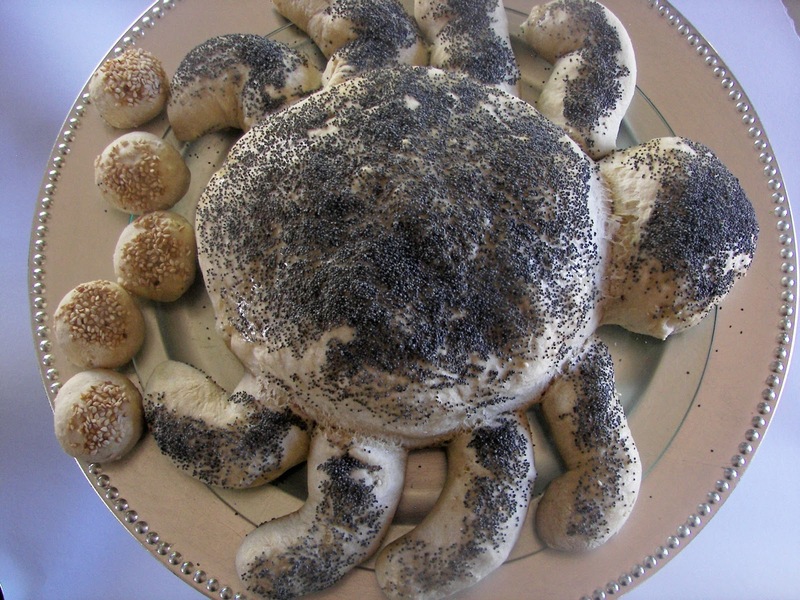 Here's a close up shot of the Spider Bread. 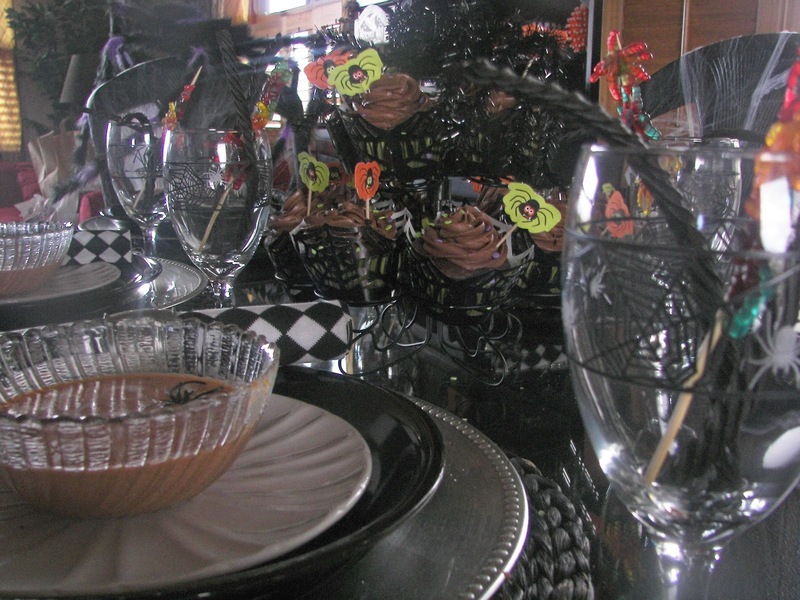 Oooh, is there candy in the spider glasses? 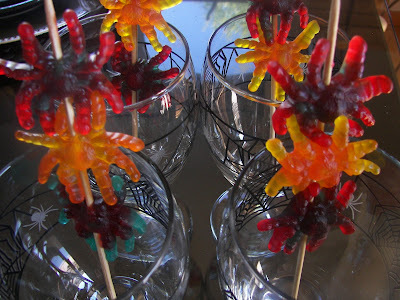 What fun to have some spider skewers! Click HERE for my post on candy skewers. What's for dessert? Cupcakes, of course! 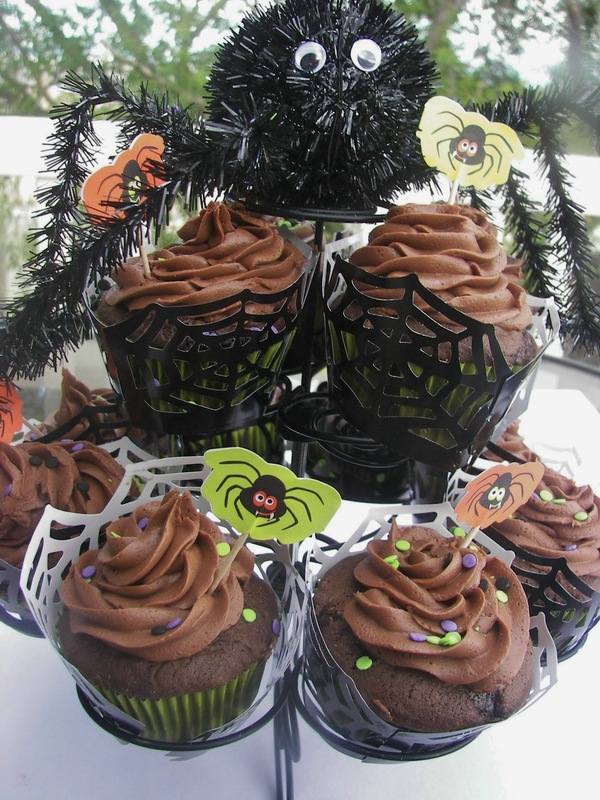 Said the spider, "I'm guarding these cupcakes! You are going to have to get past me to get one." Here's a sideview. Zoulah found these fun spider web glasses at a Smith's grocery store. Before Zoulah set the table, Leggs was busy making webs on the chairs. Here's is a final shot, an overhead view, of the table. Zoulah has had so much fun showing you her Spider Table tonight in honor of Leggs. Thanks for stopping by Red Couch Recipes. That is fantastic! I love it. I will do spiders next week. I love your soup and I love the glasses too. Very cute. What is BNOTP eighteen25's Halloween Bash? I missed that post and I just went over there and I don't see it. How FUN Joni!! Leggs, lol!! That Zoulah's got it goin' on. 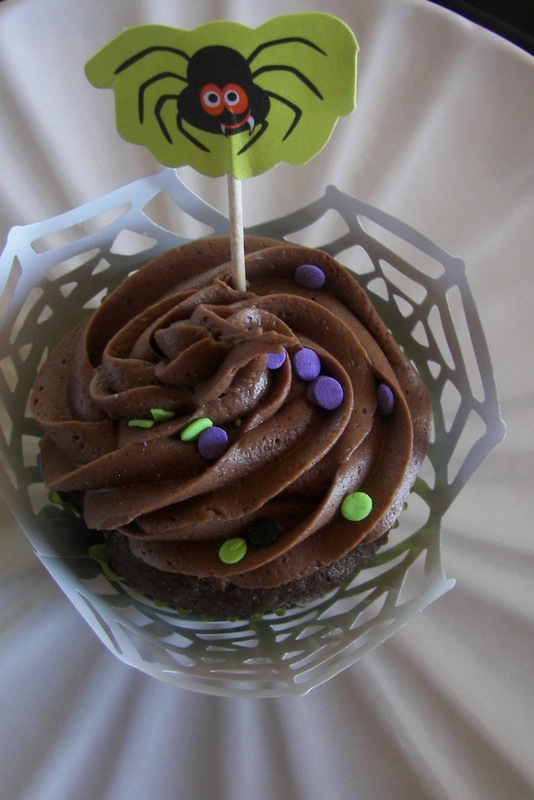 I'd love to have a cupcake....and a spider bread leg. What a cute table in honor of Leggs! Love those glasses with the spider webs on them! Your cream soup with the web looks beautiful! Love your chargers and how you paired everything up with black, white, and orange. 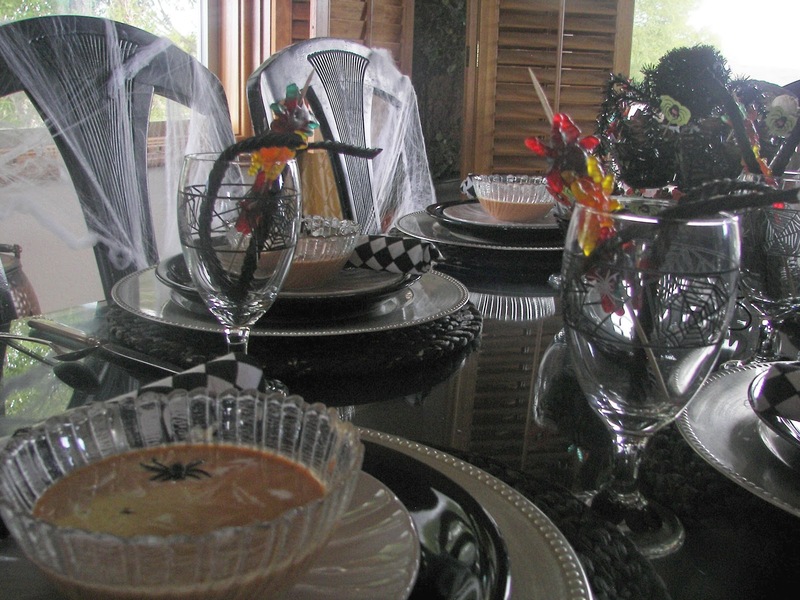 Your spider webs on the chairs are a creative touch. I've loved your Zoulah series! Wonderful! I am enjoying your Zoulah posts so much. I love all your ideas. Zoulah is so inspiring! I am taking notes for future years with my grandchildren. Thank you, Thank you! 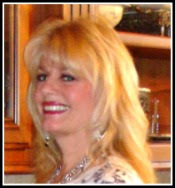 Your kids must think they have the coolest mom...it would be fun to live at your house! This is great! You and your sister are just sooo fun! You both come up with the best ideas! 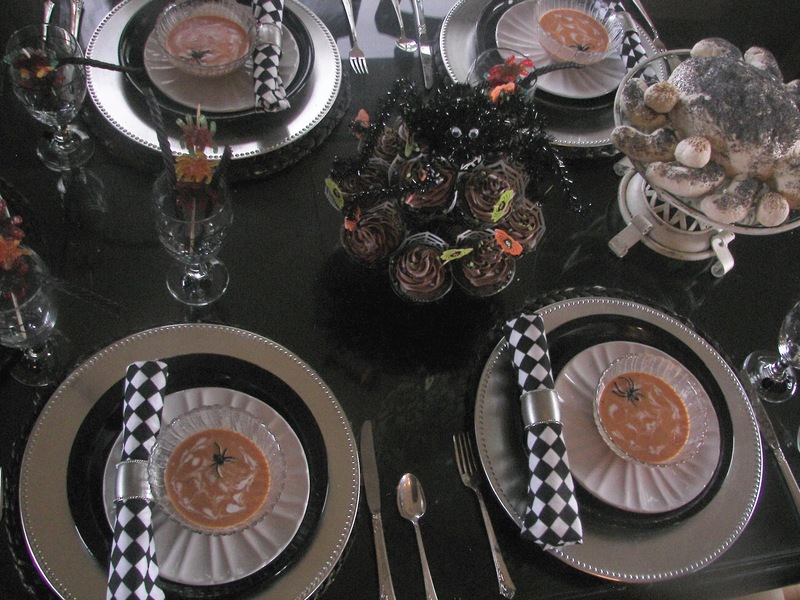 I love the placesettings..they are just beautiful and all the Halloween spiders involved...fabulous! I love the soup with the spider web drawn in there and that the kids can do it! The big spider protecting the cupcakes is so dang cute! The spider bread...is amazing! All of it is just perfect! You both inspire me so much! 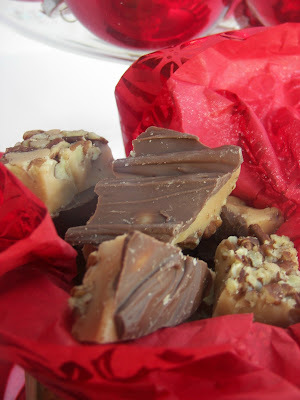 Thanks for linking up to Centerpiece Wed and sharing all your ideas and recipes and talent with us! Oh I forgot to mention how cool your new header looks! Spiders freak me out but these are adorable! Thank you for becoming my newest follower! Happy Wednesday! Zoulah is at it again, and with great results! Love that soup, even with the creepy spider:) Your cupcakes are so cute, especially with the cute toppers! Zoulah really went all out. Wonderful! love you spidery table and the food looks good too! Great glasses! I did spiders tonight too! Oh My! 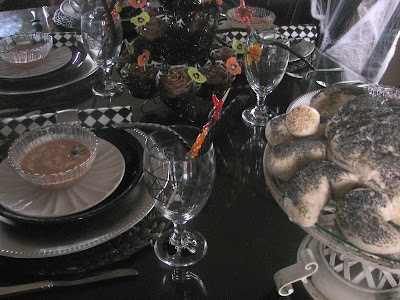 Wonderful webby tablescape. 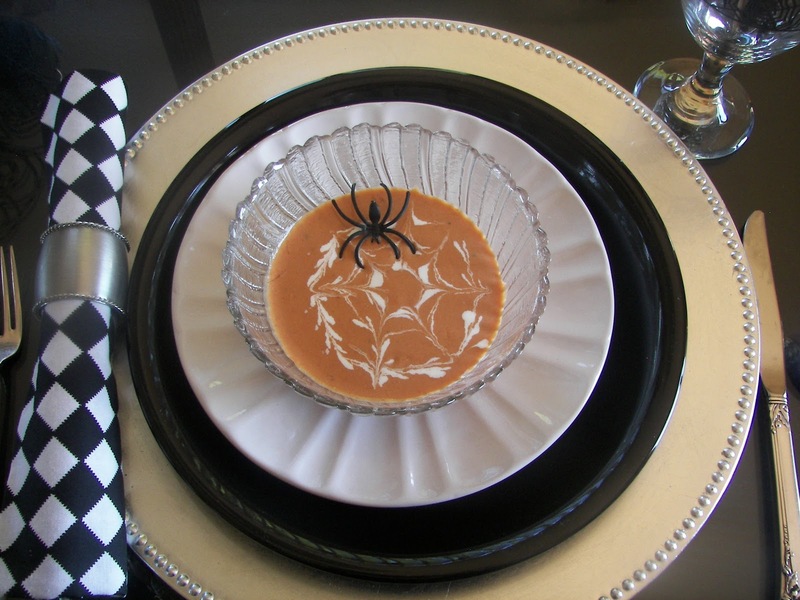 Thanks for the spiderweb soup tips. Looks like a fun setting to make as well as eat! Looks delicious! Joni, somehow you manage to be both creative and incredibly productive! I love the fun table, but the soup and bread look wonderful -- thanks for sharing such great ideas! What a fun setting! I love it!! 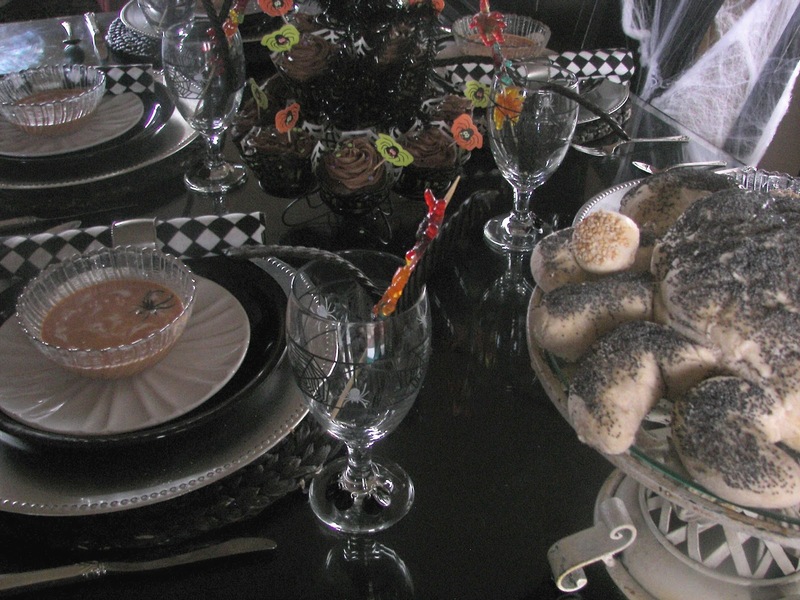 Such a spooky table. Is that last picture a cookie jar? How cute. Wow, wow, wow!!! Fabulous all 'round! That spider bread is SO cute!!!!!!!! Joni,We both are being invaded with the creepy crawlies,love 'YOUR' spider tablescape,so thrilled to meet Zoulah and Leggs! Thank you for visiting LazyonLoblolly,please come on back and I'll serve you some thriller stew. How fun! Love your spider theme~ Spider Bread even...how cute is that?! What a great job! Even spider bread!! those spider web glasses were quite the find. Great table. This looks like so much fun! Love the bread! Very interesting table. i love what looks like spiders web on the chair. That is so cute...I love the spider in the soup! Wow Joni, this is amazing!! Loving that spider bread! Love the spider web glasses and those cupcakes...yum. There is too much to eat over here, I'm gonna have to stay away! Adorable. 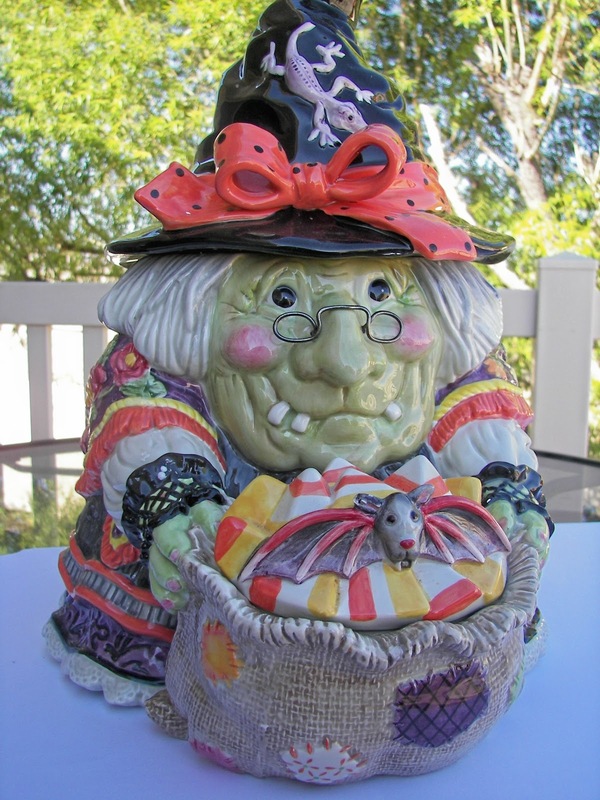 You have some bewitching ideas! the spider webs in the soup were great! i would have never thought of it! thanks for sharing your spidey-senses. How wonderfull ideas, in México this is not a big party but i will enjoy a lot sharing yor ideas with my kids. thanks!